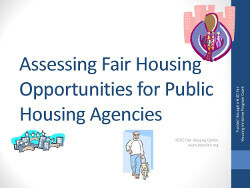 This page contains information and resources for Public Housing Agencies (PHAs) to assist them in assessing fair housing compliance and opportunities. If you have any questions, please use the “Contact Us” button on the navigation bar above. According to 24 CFR 903.7(o), the civil rights certification says that the PHA must also certify that it will affirmatively further fair housing. This compliance is achieved by fulfilling the requirements of Sec. 903.2(b): (1) Examines More...its programs or proposed programs; (2) Identifies any impediments to fair housing choice within those programs; (3) Addresses those impediments in a reasonable fashion in view of the resources available; (4) Works with local jurisdictions to implement any of the jurisdiction's initiatives to affirmatively further fair housing that require PHA involvement; (5) and maintains records reflecting these analyses and actions. 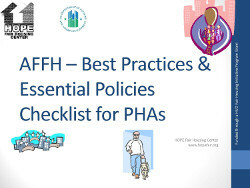 Our download page contains guidance, regulations, reports, and examples of best practices; including the PHA Fair Housing Manual produced by HOPE Fair Housing Center. We ask that you please register your information in the form below in order to access the download page so that we are able to track download requests. You will need Adobe Acrobat or Adobe Reader to open the secure documents in PDF format. HOPE was previously funded by the U.S. Department of Housing and Urban Development to provide specific gudaince, technical information, and data available to assist a PHAs in Illinois with assessing their own compliance with Federal Affirmatively Furthering Fair Housing (AFFH) requirements. The webinars below include some of that information (relevant to PHAs outside of Illinois as well). Please click below to view/download the webinars. From Amazon.com: "Under the New Jersey State Constitution as interpreted by the State Supreme Court in 1975 and 1983, municipalities are required to use their zoning authority to create realistic opportunities for a fair share of affordable housing for low- and moderate-income households. Mount Laurel was the town at the center of the court decisions. As a result, Mount Laurel has become synonymous with the debate over affordable housing policy designed to create economically integrated communities. What was the impact of the Mount Laurel decision on those most affected by it? What does the case tell us about economic inequality? Climbing Mount Laurel undertakes a systematic evaluation of the Ethel Lawrence Homes--a housing development produced as a result of the Mount Laurel decision. Douglas Massey and his colleagues assess the consequences for the surrounding neighborhoods and their inhabitants, the township of Mount Laurel, and the residents of the Ethel Lawrence Homes. Their analysis reveals what social scientists call neighborhood effects--the notion that neighborhoods can shape the life trajectories of their inhabitants. Climbing Mount Laurel proves that the building of affordable housing projects is an efficacious, cost-effective approach to integration and improving the lives of the poor, with reasonable cost and no drawbacks for the community at large."